Your body is a complex machine. The foods you choose and how often you eat them can affect not only your general health but also the health of your teeth and gums. If you consume too many sugar-filled sodas, sweetened fruit drinks, juices, milk, or non-nutritious snacks, you could be at risk for tooth decay. Tooth decay is the single most common chronic childhood disease. The good news is that it is entirely preventable. At Ridgeview Family Dental, we see children of all ages. We encourage starting dental visits at an early age so that the child is comfortable being in the dental chair and becomes familiar with the surroundings. The American Academy of Pediatric Dentistry recommends children should have their first dental visit within the first three years of age. This helps ensure the child’s proper tooth development, as well as prevention and early detection of dental problems. On the initial visit, we will do everything possible to make it a fun, enjoyable and positive experience. While our doctors are not Children’s Dental Specialists, they have great success with making children feel at ease during treatment. 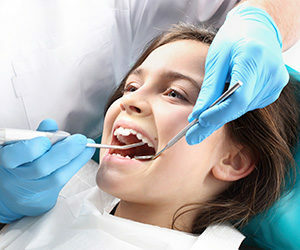 Children dentists fulfill many important functions pertaining to the child’s overall oral health and hygiene. They focus on the proper maintenance and care of baby teeth, which are essential to facilitating good chewing habits, proper speech production, and also hold space for permanent teeth. Brush twice a daily, Brush after each meal and drink water if possible. Floss once a day, at night time preferably. Tooth decay happens when the bacteria in your mouth comes into contact with sugar, creating acid. While juices and milk are healthy for a child, too much can lead to tooth decay. Water is the best drink to help prevent dental caries. Any foods that stick to the teeth such as peanut butter, crackers, raisins, and fruit roll ups are also harmful to the teeth as they stay on the teeth and give a continual bath of sugar. We would love to discuss your options! Please contact our office at 660-747-9117 to schedule a consultation. Our office serves Warrensburg, Oak Grove and Windsor and surrounding areas. To learn more about Children’s Dentistry, please contact us at 660.747.9117 today to schedule an appointment.